When I was a child, my 5-person family spent summers in Alaska. We camped in a 23-foot RV (the kind with the cute, hat-brim overhang) and traveled back roads looking for what my dad termed as “the local color.” Often, this would lead us to out-of-the-way taxidermists who carved woodland scenes into antlers, or trucker diners with a menu written entirely in the native language of the tribes who lived there. One time, we met a tanner in the Yukon territory who asked us children to bounce on a moose skin he had stretched out, trampoline style, in order to thin and expand it. My brother bought a wolverine skull from him and he invited us back to his cabin to meet his wife and family. He showed us some slides he had of a fishing and hunting trip he went on, including a few shots of him chewing the white rind of a seal’s fat and eating an eyeball the size of a pudding cup. It was disgusting. We loved it. In recent years, in his Christmas card, he has expressed his dissatisfaction with the amount of traffic his town has now that they have a stoplight. A few hundred miles to the south of this new busy town, is a town called Skagway. Skagway marks the beginning of the White Pass, the trail that led to the Klondike. To gold. And the beginning of so many deaths. During the gold rush, the men would dock at Skagway and buy horses if it was summer and start the treacherous climb including Bennet trail that wound over the wild mouth of a ravine and into the mountains beyond. They didn’t know where they were going—there were only vague claims from newspapers advertising gold nuggets the size of a man’s heart, ripe for the picking. They were headed up, over the mountains, and into their new wealthy lives. And they were racing each other. Every time we went to Skagway, we would pay our respects to that ravine under Bennet Trail. We gathered at the guardrail to read the historic marker and look at the black and white pictures of the renamed ravine, “Dead Horse Gulch.” The men, bent on the gold, haunted by the smell of that bright possibility, led their horses up the muddy trail. The horses, many too old to be there, all of them overloaded with mining necessities, inevitably faltered. Wet with glacial silt and humidity, the trail foundered them in mud up to their knees, or broke their backs, or snapped their legs. The men, bent on that gold, unloaded their packs from the animals, took the horse’s metal shoes, and pushed them off the lip of the trail, sending their bodies crashing to the valley below—making way for the next horse to take its place. The dead horses were piled so thick that the bones are still there today. As a child, I would squint my eyes and imagine I saw the white swerve of a jawbone, jutting up at me from behind a boulder. I imagined the cold heave of a shoulder into the side of an animal that died making men rich. I imagined the mane outstretched like a hand as it caught the wind and fell. The soft muzzle, knickering. If any natural place is haunted, it’s there. But not by the horses. If there is mercy, those creatures have passed to a place that is people-less and filled with sweet hay fields and shade trees. No, this place, this valley, this gulch—a word that sounds like a dry swallow—is haunted by the lengths humans will go to gain. In fact, Alaska, the last parcel of pioneer spirit and untamed wild patches of land, is haunted by its own cruel and greedy history. Aside from the normal horrible kinds of theft from native peoples, Alaska’s history includes the siren song of money. 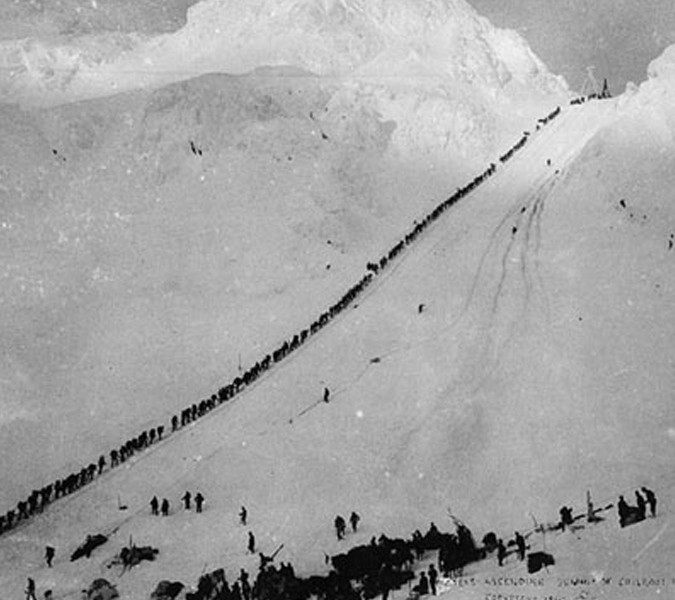 Unlike the gold rush in California, Alaska’s call brought people up to one of the most inhospitable places, promised them money, and left them to die, teeth chattering from scurvy, backs curved from burden, lips sneered in frostbite. I am still haunted by Dead Horse Gulch. And all the spots in Alaska where my brothers and I would dutifully file out of the side of the camper to read the historic marker, the cautionary tale—maybe talking about an avalanche that destroyed an entire town, or a stretch of miles named after a woman who came looking for her husband only to turn to prostitution to pay her way back to the lower 48. There we were, one hundred years later, reading the placard of a story of hardship of the exacting price of gold and its seeking, haunted and haunting by the sadness of humanity’s addiction to splendor. Those boys, those men, those women, strapped to the sluice box, to the gold pan, tortured by the chance at something. Those men, slowly trudging up to that pale light at the top of the next hill, the next rise, the next summit—seeking something they had risked everything for—including their own humanity. I’d like to think, that those last seconds weren’t spent in fear, but in exhilaration. Without the clamp of buckles over sore ribs, the over freighted load, the ache of hunger, the sticking mud, the chafe of a saddle bag foamed with sweat, the sting of a whip on a tired haunch. Perhaps those last seconds were made of the same stuff that a bird feels when it flies for the first time or a child when she takes her first running steps. I’d like to think of Pegasus, leaping out over the void, wind smoothing past his ears like the shushing sound of rapids. The trees and the rocks and the grasses retaining the memory of a horse who sails on the back of the breeze and never ever falls.